Never depend on a single income. Make Investment to create a second income. It is famous saying by the richest man in the world – Warren Buffett. Most of us rely on a single source of income. A single income has become familiar and accepted norm everywhere. However, it’s risky. You never know that when that source may dry up. Perhaps your company goes out of business, or you get fired. So to overcome situation mentioned above, it is always advisable to build second income via alternative income sources. Here are 15 Second Income Ideas that will help you to generate an alternate source of income. For better understanding, I have divided these ideas into three parts. The first alternate income idea is multilevel marketing or network marketing. In this business, you need to create members under you for selling product and services of MLM Company. You have to be careful in selecting the MLM Company. Here is a list of 10 Best MLM Companies in India. You can blog and generate a decent part-time income. You require expertise in the selected niche as well as technical knowledge to manage the blog. There are many examples of bloggers who are earning very good secondary income via blogging. Your success in blogging depends on time, energy and efforts placed by you. Another very good way to generate an alternate income is by starting a YouTube Channel and becoming YouTuber. As a YouTuber, you need to make unique videos on various topics. You can take help of readymade animation software for making a video. Another alternative is to use a high-quality camcorder for making videos. You can generate very good income via YouTube Channel. Affiliate marketing is the next secondery income generation idea. In this idea, you need to increase sale of associated products. You can use email, WhatsApp or SMS marketing for this. If someone buys a product via you, you will be paid a commission. Mostly all online store including Flipkart, Amazon offers affiliate marketing membership. Your commission level depends on commission rate. If you are photographer this idea is for you. In this idea, you need to sell your photos online. There are many advertisement companies and individuals who are ready to pay money for good photographs. Starting an online course is next the list of second income generation idea. There are three different ways to opt for this idea. First is hosting courses on your own website. The second way is making use of YouTube and third way is to associate yourself with a website such as CueMath etc. Peer 2 Peer Lending is one of the best second income source generation idea. If you have a lot of money but no time you can use P2P lending for making money. There are multiple Peer 2 Peer lending platforms available online. You can make use of these platforms. However, please note that it is a risky option of income generation. Next alternate income generation idea is stock market trading. This idea requires money, time and deep understanding of the stock market. This idea is risky in nature and not recommended for the beginner. You can invest in high dividend stock and become financially free. The investment required for this idea is very high. You have to work hard in identifying high dividend stocks. Next second income generation idea is earning from the franchise of business. If you are good at doing business you can start your own business and offer franchise with a fixed commission. It requires a lot of time and money to establish a business and start franchise business concept. If you have a lot of money you can invest in someone’s business and act as a passive partner. It is one of the best ways to generate alternate income. This idea is suitable if you don’t have time but you have enough money. You need to be careful in the selection of business. You can also generate a second income by renting your commercial or residential properties. The investment required for this idea is very high. It is recommended option only for High Net worth investor. You can also generate alternate income by renting your vehicle. You can buy a car and give it on rent to private or car renting companies such as OLA or UBER. There are many local business owners who require vehicle on rent. If you have empty space in front of your house or at roof you can rent this space for advertisement. It is the simplest way to earn a second income without investment. Conclusion – At the end, I would like to conclude the discussion by saying that one should work towards establishing a second income source or alternative income. 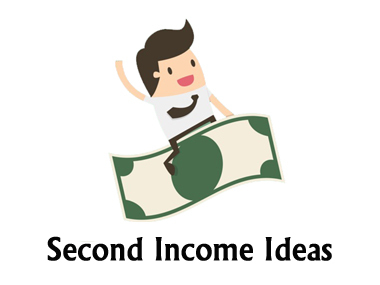 Select a second income source idea, make a plan and work till you become financially free. If you need any help or guidance for building second income source, feel free to share it via comment section.